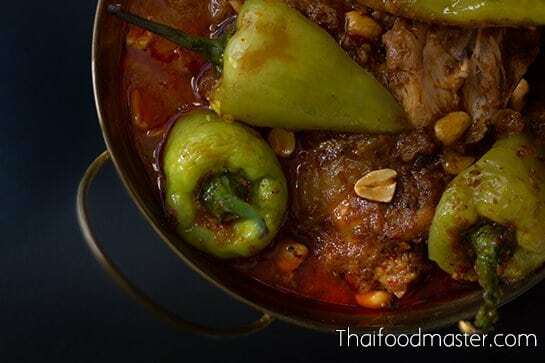 This recipe comes from Phra Sucharit Suda (1895 -1982), who was the first consort of King Rama VI (formerly Prueng Sucharitakul) (พระสุจริตสุดา (เปรื่อง สุจริตกุล)”). 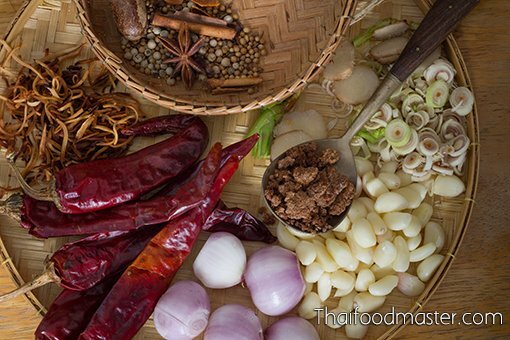 On her 60th birthday, in 1955, Phra Sucharit Suda published a cookbook called “How to Cook Thai and Western Food (วิธีทำอาหารไทยและฝรั่ง)”, based on her own recipes. The popularity of the richer, thicker Massaman curry came to overshadow this dish, and today it is barely present on the Thai culinary landscape. Food culture is constantly evolving and changing: Dishes that are less popular among wider populations have been known to entirely disappear: This is one of the reasons that we have chosen to write about this forgotten dish, and to hopefully preserve it for future generations. In the early days of his reign, King Rama V visited several neighboring territories including Singapore, Java (1870), Burma and India (1877). At that time, these kingdoms were western vassal states, and The King sought practical knowledge on the administrative methods implemented by the British and the Dutch. 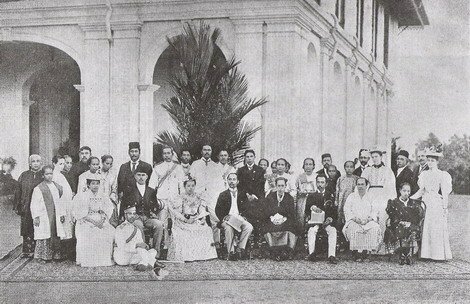 King Chulalongkorn was accompanied by the Queen Consort of Siam, Saovabha Phongsri [สมเด็จพระศรีพัชรินทร์ฯ], as well as a sizeable entourage; in addition to observing the systems and procedures of governance, the group enjoyed many of the dishes created by Javanese Muslims, dishes strongly influenced by Indian and Arabic cooking. 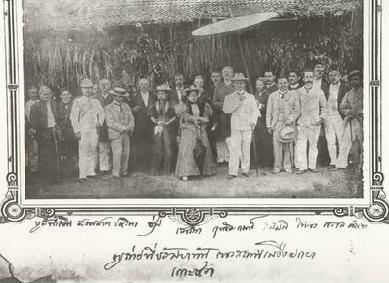 King Rama V visiting Java. King Rama V visiting Singapore. 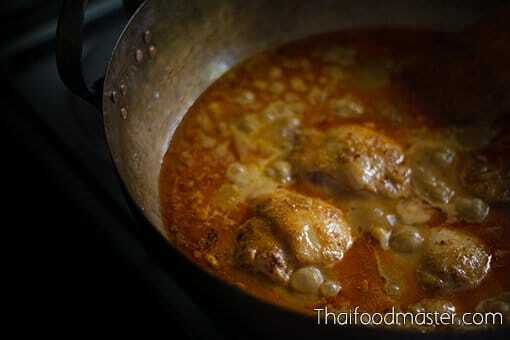 Gaaeng phet gai jee juaan (แกงเผ็ดไก่จี่จ๋วน), satay (สะเต๊ะ) and khaao khlook naa si bpaa ji dto:h (ข้าวคลุกนาซิปาจิโต) moved into the Thai kitchen following the royal journeys. 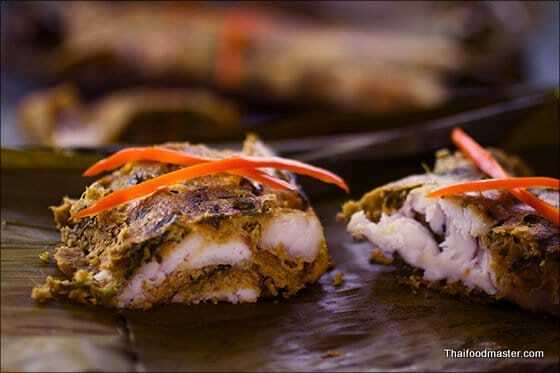 These dishes were swiftly adapted for the Siamese palate, again demonstrating the proficiency of the Siamese in accepting and integrating foreign influences in politics, culture and cuisine – and transforming them into something uniquely and truly Thai. 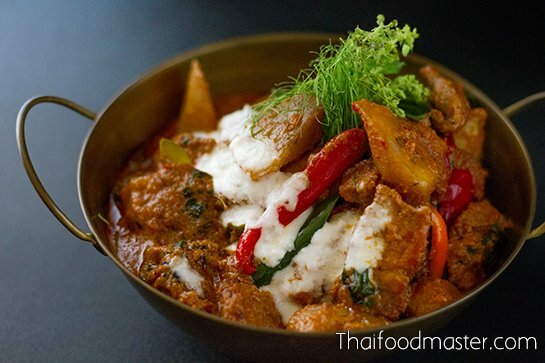 The dish remained popular within Royal society circles, and was published publicly after the Siamese Revolution of 1932. The recipe appeared for the first time in 1935, in two books. 1935 – “Sai Yaowapa”, printed by Sai Panya Samakom (สายเยาวภา จัดพิมพ์โดยสายปัญญาสมาคม) as a memorial book for Princess Yaovabha Bongsanid, the daughter of King Chulalongkorn, Rama V (พระเจ้าบรมวงศ์เธอ พระองค์เจ้าเยาวภาพงศ์สนิท). 1935 – “The Key to the Kitchen” (กุญแจห้องเครื่อง), written by Paw. Thuay Athawng (pseudonym) and published by Krung Thep Bannakarn (โรงพิมพ์กรุงเทพบรรณาคาร). 1949 – The recipe appears in Lady Gleep Mahithaawn’s book “Recipes for Teaching Children and Grandchildren” (หนังสือกับข้าวสอนลูกหลาน), printed for her 72nd birthday celebration on January 7, 1949. 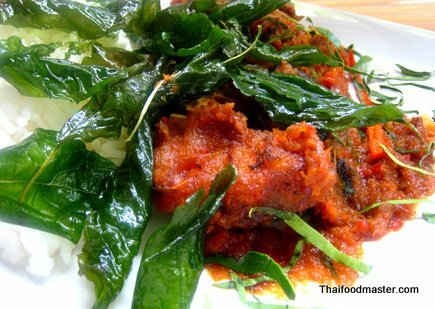 1955 – The recipe is listed in a book called “How to Cook Thai and Western Food” (วิธีทำอาหารไทยและฝรั่ง) by Khun Phra Sucharit Suda. 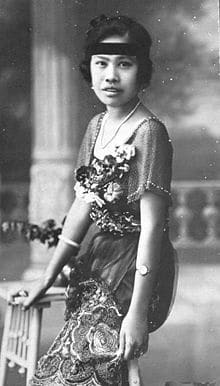 The daughter of Chao Phraya Sudharm Montri, and the first consort of King Vajiravudh (Rama VI), Phra Sucharit Suda was the first lady to receive the royal title, Khon Phra (คุณพระ), in 1921. 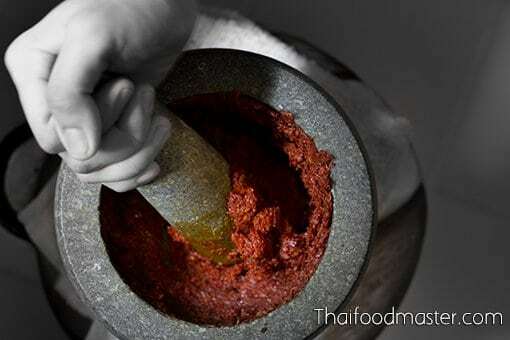 She was well trained in Thai culinary arts by her grandmother, Lady Ratchapakdee, (Thongsook Sujaritkul) (คุณหญิงราชภักดี (ทองสุก สุจริตกุล)). She was also close to her niece, Tao Wanidapijarinee (Jao Jom Perm) (ท้าววนิดาพิจาริณี (เจ้าจอมเพิ่ม ในรัชกาลที่ ๕)), a wife of King Rama V, who served as the chief of the Royal Kitchen. 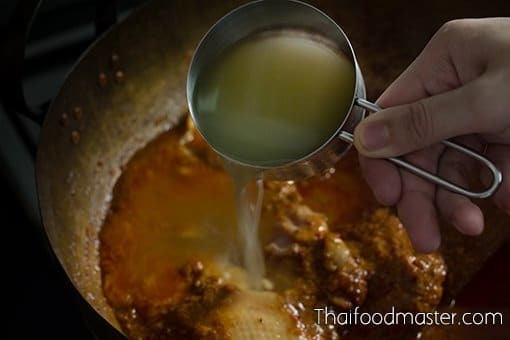 Her culinary skills brought her to the royal kitchen of the Phaya Thai Palace, the Royal Residence of Queen Saovabha Phongsri of Rama V, who had accompanied the King on his trip to Java. 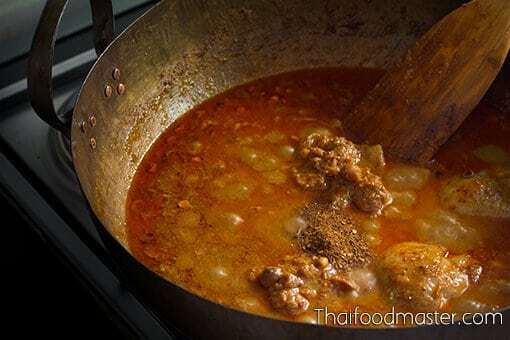 There, Phra Sucharit Suda learned to prepare gaaeng phet gai jee juaan. 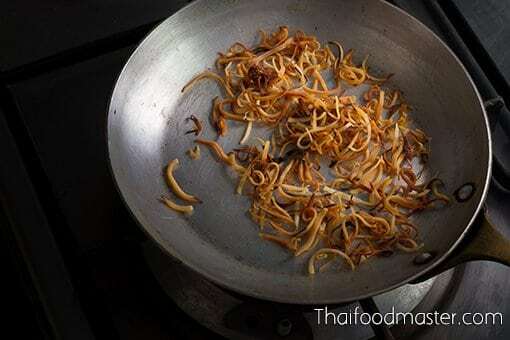 Roast the grated coconut until brown and crispy, and set aside. Roast the dry spices until they are fragrant. 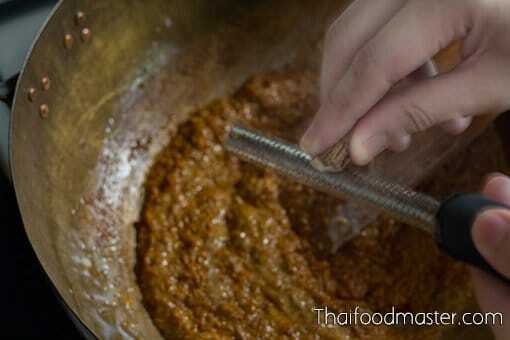 Prepare all the ingredients to make the curry paste. 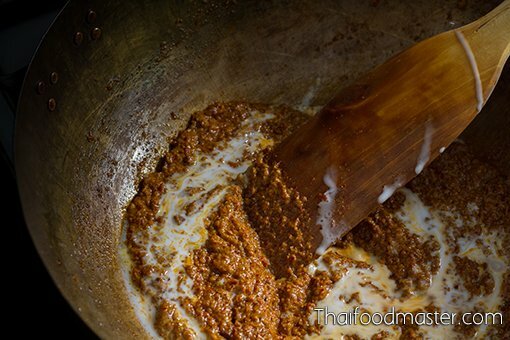 Pound all the curry paste ingredients until you get a smooth, consistent curry paste. 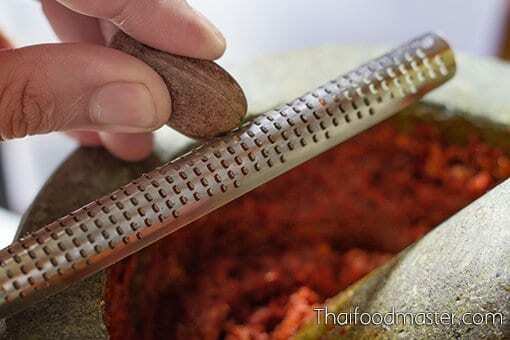 Grate nutmeg into the curry paste. 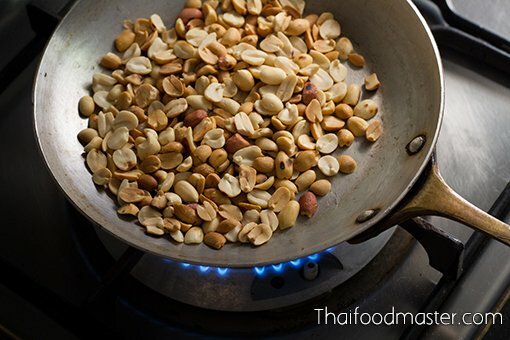 Roast the unsalted peanuts until fragrant and lightly charred, and set aside. 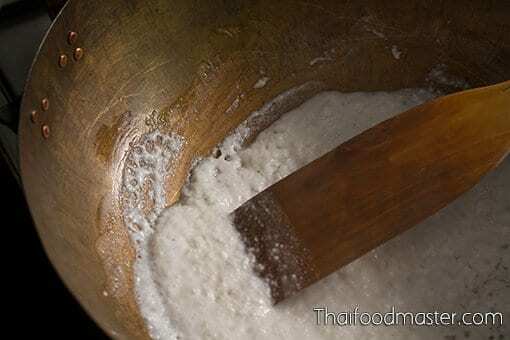 In a cooking pot, heat the coconut cream until it breaks (cracked) and oil appears. 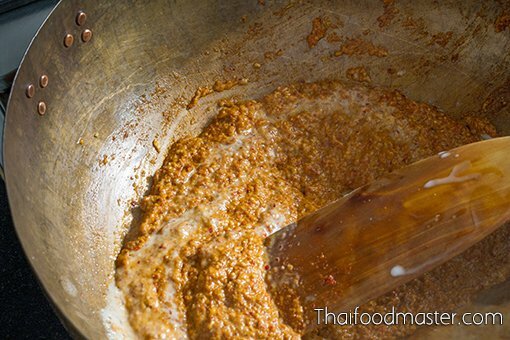 Add the red curry paste. 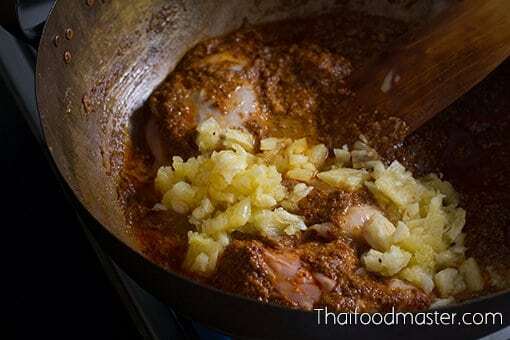 Fry the curry paste in the cracked coconut, gradually adding more coconut cream. 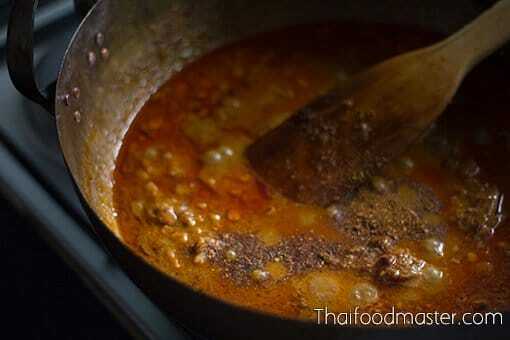 Continue to add coconut cream while frying the curry. 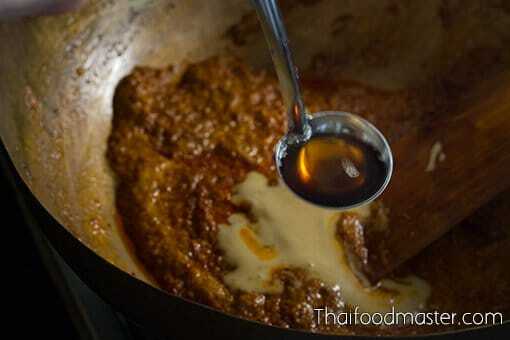 The curry paste is ready when all the coconut cream has been incorporated, and red oil floats on top. 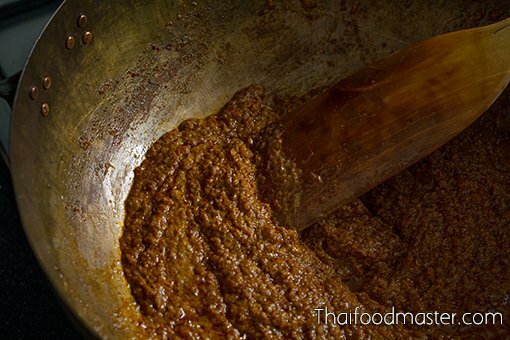 Season with fish sauce and palm sugar. 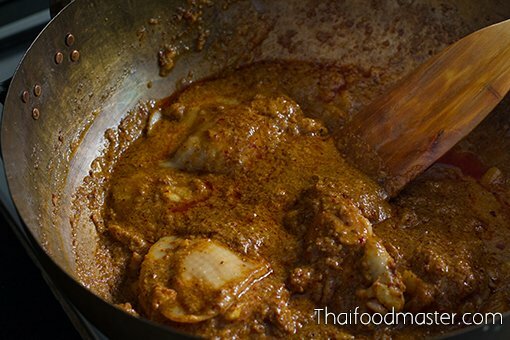 Cook the curry until the chicken is almost done. 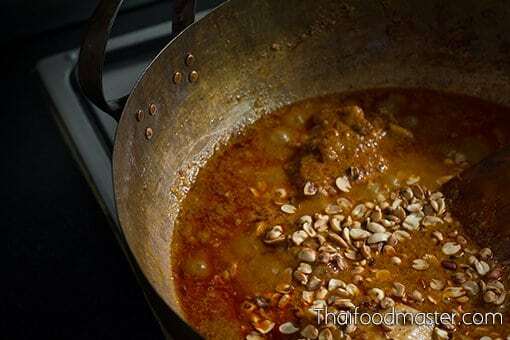 Simmer over low heat until the chicken is soft and tender. 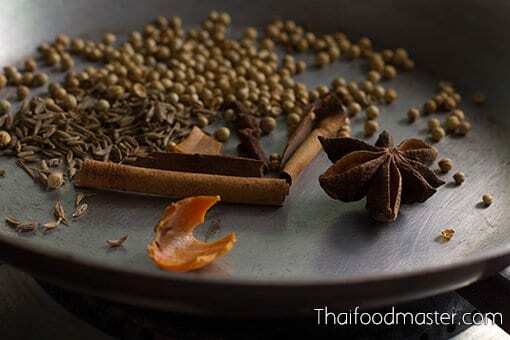 Add ground roasted coriander seeds, to freshen the spice aroma. 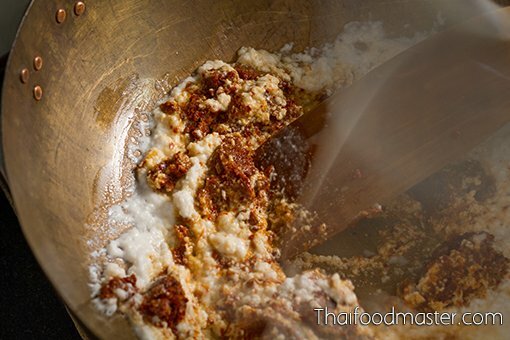 Add dry chili powder to sharpen the heat. 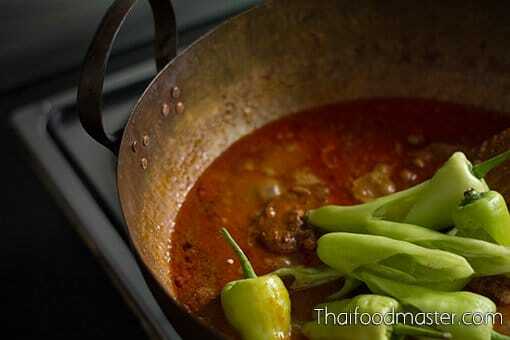 Add halved light green banana chilies. 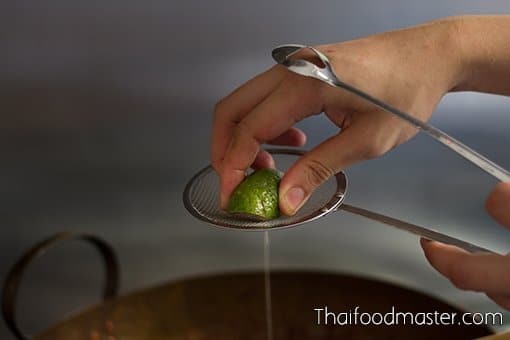 Squeeze in the juice of bitter orange (sohm saa).